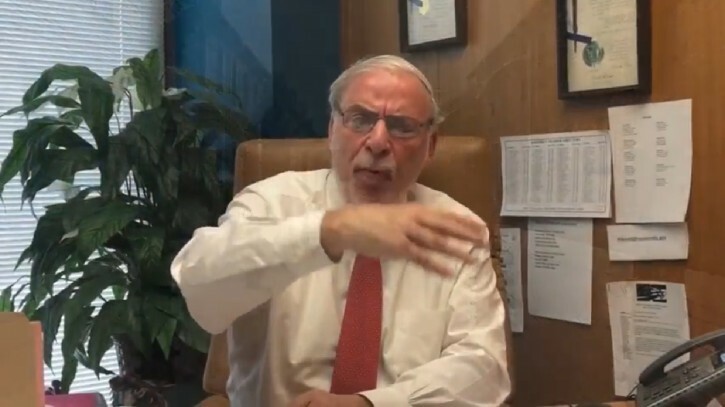 Warsaw - Just hours after Assemblyman Dov Hikind made a public pronouncement blaming Poland for its role in the atrocities of the Holocaust, Poland’s consul general in New York City returned fire, slamming Hikind for his remarks, categorizing them as inflammatory and erroneous. Hikind launched the PolandMurderedJews.com website on Wednesday with a deliberate goal of defying Poland’s newly enacted law that criminalized any mention that held the country responsible for crimes committed by the Nazis as previously reported on VIN News (http://bit.ly/2pOxIvi). The website includes a just over two minute video with Hikind telling of multiple family members who were killed on the day they arrived in Auschwitz, where both of his parents were imprisoned during World War II. Shifting from Hikind’s Borough Park office to the Capitol building’s Million Dollar Staircase the assemblyman continues, “here in the halls of the New York State Assembly, we know the role of so many Polish citizens involved in the murder of innocent men, women and children. A statement released by Consul General Maciej Golubiewski chided Hikind for deliberately spreading misinformation about the Polish Anti-Defamation law which does not deny the Holocaust or documented incidents of anti-Semitism committed by Poles against Jews. Reflecting back on a visit to Albany just three weeks ago where he was warmly welcomed, Golubiewski took Hikind to task for suggesting that his views reflected those of the entire Assembly and his repeated use of the phrase “Polish death camps” in the video. “It is deeply worrisome that someone representing the city of New York in the New York State Assembly would purposefully use the expression that has been officially condemned by both Israel and Poland and is officially considered inaccurate by the stylistic standards of the most important US newspapers,” said Golubiewski. Responding to Golubiewski’s criticisms, Hikind said that he stands by his remarks. The Nazis did not establish the concentration camps in Germany, even though that would have been the logical place, because they knew that the German people would not have stood for it. Instead they chose Poland, because they knew that the Poles wouldn't have a problem with the death camps. Contrast Poland with Bulgaria where the people and the Church actively prevented the Nazis from exterminating the Jewish population. As much as i dislike Assemblyman Hikinds Zionists tactics to inflame antisemitism for a change he is so right. Its a fact and part of history that yes polish citizens were a huge helping hands in killing millions of Jews. In fact the Nazis couldn't of wiped out the entire Jewish population in Poland with the help pf pollaks. When Jews came back after they were finally liberated the pollaks made pogroms killing many many Jews. It is deeply worrisome that someone representing the city of New York in the New York State Assembly would purposefully use the expression that has been officially condemned by both Israel and Poland and is officially considered inaccurate by the stylistic standards of the most important US newspapers,” said Golubiewski. It's deeply worrisome that that someone representing the Polish government would perpetuate centuries-old Polish anti-Semitism and revise history. Polish dogs! They hate today as well, and here in the US too. well Dov got in the news right before pesach vacation, anyway he is right. Poland is governed by a Conservative Christian Party today. Remember next time when you vote Republican. Nice try. There is no Conservative Cristian Party in the US. Just like there is no Conservative Jewish Party. On the other hand there are Conservative Christians and Conservative (referring to political, not religious bent) Jews. All ways better than a semi communist party. The only responses he got on that website were from Polish dogs attempting to label him a liar and revise history. Amazing how inundated these animals are with hatred and will believe anything. Q: What did J-s-s say to the people?